Clarence Peters, Jr., the son of Clarence, Sr., and Janie Peters, was born on April 27, 1920, in Caddo, northwest Louisiana, near to where his father worked as a warehouseman for oilfield supplies in Oil City. After attending Greenwood High School in Louisiana, the 18-year-old shortstop began his professional baseball career with the Class C East Texas League’s Marshall Tigers in 1938. Playing just a handful of games, he was soon assigned to the newly-formed Class D Texas Valley League’s McAllen Packers, where he batted .284 and helped the team make an exciting, although fruitless, late-season run for a play-off spot. In 1939, he returned to the Marshall Tigers and batted just .202 over 97 games as the team’s starting shortstop, finishing up the season playing 24 games at third base and batting a lowly .173 for the Class D Evangeline League’s Jeanerette Blues. Peters began the 1940 season as the starting second baseman for the Evangeline League’s Port Arthur Tarpons, playing 19 games and batting .232 for finishing the season in the East Texas League with the Texarkana Liners and the Henderson Oilers. The following year, 1941, was to be the young infielder’s last season in professional baseball, playing 33 games at shortstop for the Class C Cotton States League’s El Dorado Oilers, batting just .197. Peters entered military service in June 1942, leaving his wife, Dorothy, at the family home in Greenwood, Louisiana, and trained at Camp Pickett, Virginia, and Camp Blanding, Florida. He was then assigned to the 313th Infantry Regiment, 79th Infantry Division, which was destined for Europe. The division arrived in England in April 1944, and landed at Utah Beach, Normandy, between June 12 and 14. Going into combat on June 19, the division entered Cherbourg on June 25, and held a defensive line at Ollonde River until July 2, and then returned to the offensive, taking La Haye du Puits and surrounding villages, south of Cherbourg, in house-to-house fighting. The offensive proved costly. The division suffered 2,930 casualties in 11 days, including Technical Sergeant Clarence Peters, Jr., who, aged 24, died from wounds on July 8, 1944. The wounds had been sustained the day before and a war department telegram received by his wife, Dorothy, stated that her husband had been "slightly wounded." The tragic news of his death was to follow shortly afterwards. Clarence Peters’ body was returned to the United States after the war and rests at Greenwood Town Cemetery, Louisiana. 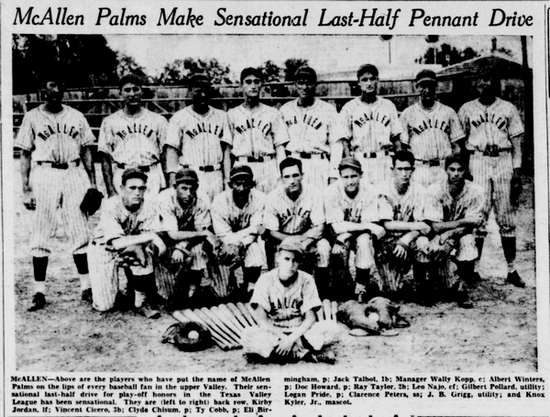 The 1938 McAllen Palms - Clarence Peters is front row, second from right. The grave marker of Clarence Peters, Jr., at Greenwood Town Cemetery in Louisiana. Thanks to Davis O. Barker for "discovering" Clarence Peters, Jr. Thanks also to Astrid van Erp for help with photos and information for this biography.